Incredibly disappointed that this was declined even technically. It's a gaping inconsistency that you adhere to SOME Metro design principles within a Windowed application but pick and choose which get applied and which don't. This is an improvement over the beta, but only incremental. I'd like to express how much more "alive" the RC looks. The lack of chrome and proper color based highlighting really seem to naturally draw emphasis on what's important, when it's important. I will say I hope this isn't the end of UI tweaking. thenonhacker's mockup is really desireable looking. In particular, the font sizing and bolding on the collapsed panels is a "soft" way of making them visible and present without stealing focus. Again, great work! I love seeing the improvements in each iteration. We do listen. That doesn't mean we do everything that is suggested, but I assure you we spend extensive time sorting through your suggestions, and taking an honest look at them. And we're actively tracking your feedback on the RC update announcement as well. Thanks for passing along your opinions. I've been using VS11's Dark theme since the beta release. I took a few weeks to learn how to recognize and use things. Now I think the new experience is great. Colors may need some review but are okay for me. Seems like Windows 8 and Visual studio want to bring the XP Beta watercolour theme back! Better than the current style, but I still prefer VS2010 over this one. There really wasn't that much wrong with the style of VS2010, a redesign is not necessary in my opinion. I'm digging Jon's Markup 5 with the lower saturation. I like that make over. To VS guys : If you decided to go metro style then go full metro. Why stand in between ? I agree with daniel, i don't want change in my UI and i don't think "modifying the changes" is the way to go. The changes were ******, revert them and think there is no change needed or, as i posted in the actual issue, make VS themable and let the community handle it, just ship the base UI like 2010. @Sven: This version will have the close button active area extend to the upper right corner, so that it's consistent with other Windows apps. Why don't you use a standard window border? This window would drive me nuts. I want to click blindly into the upper right corner to close my windows and not target such a small close button which cannot be clicked by trowing the mouse into the hot corner. @VSlover: If you maximize VS, the status bar will optically recede at the bottom edge of the screen, making it secondary. I'll consider reducing the saturation of the bar like Jon did. @Adam: Since Revamp V2 I was figuring out a way to convert the toolbar into QAT, but I realized that VS 11 needed an Office Fluent UI in the first place... No more multiple toolbars hanging around, and I can imagine the toolbox to be similar to Visio's Shape Templates panel. I'm not a fan of the bright purple status bar, and the non-standard chrome, but the rest of it is pretty nice actually. I wouldn't mind seeing an Office-esque "Quick Access" toolbar. Then I would get rid of the main toolbar entirely. This is starting to look real nice. But I keep on my position: the Office-like bright status bar hurts my eyes. It's the single most prominent and flash thing on the whole screen, and perhaps the less useful one. @Daniel: Historically they've always changed the UI, to conform with the look and feel of the latest Windows and Office versions. I wish UserVoice had a vote down option. I can just see Microsoft thinking this is a great idea, in the same way they thought making everything grey would be welcomed with open arms. 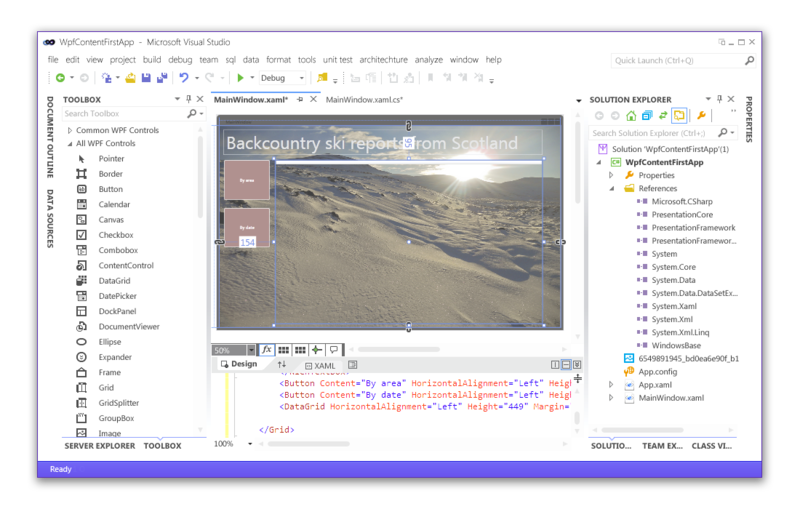 I don't want to see any of these kinds of changes in Visual Studio 11. I'd much rather the UI was restored to exactly the way it was in VS2010, and other feature requests worked on instead. I think you saw Revamp V1. The latest revamp is V5, and has color to it (see 2 comments back).